Do you know you can download torrent file with IDM (Internet Download Manager) easily? If no then I have crafted this complete and step by step guide is just for you. Torrents and torrent websites are very popular for downloading anything such as movies, games, music, ebooks, video tutorials, tv shows and anything else. There are hundreds of torrent websites are available on the web, where you can download free torrents. You can find your desired stuff by visiting any torrent site and it’s the reason for torrents popularity. Moreover, you can also get almost all types of registered application with the help of torrent. Downloading torrent files with torrent software is such a headache due to lowest downloading speed. The downloading speed of torrent is very slow as compared to IDM(Internet Download Manager) software. Why do I download torrent file with IDM? Some users may think why should I download torrent files with IDM? If you are one of them, then there is a simple reason because you can download torrent with IDM with 5X faster or even more than any other torrent client. Torrents with lower seeders take too much time for downloading than one have higher. How to Download APK Files in Your Computer? If you want to download your torrent stuff fastly then your torrent file must have a good amount of seeders. Everyone on the net wants to download their data quickly and fastly without spending a bit of extra time (even for seeding). So, this is an excellent way to download torrents quickly and more fastly without spending an extra time. When do I download torrent with IDM? Well, You find a torrent that you want to download, but torrent seeders are low than leechers. A higher number of seeders can help users to download their stuff with the highest speed. It means if a torrent with more seeders will be download more fastly than the one having low. Having more leechers than seeders will take too much time to download. That’s the situation when IDM will help you to download your stuff faster than torrent client. It can save a lot of time and frustration too. By using this guide, you will be able to download your desired data at maximum speed. (Depend on your internet connection speed). How to Download Torrent File with IDM? So, Here is a step-by-step guide to download torrent file with the help of internet download manager. Step 1: The very first step you need to do is, download .torrent file from any torrent site. Step 3: After website loads, click on the “Upload .torrent file” button and choose your required file that you want to download with IDM. After the selection of your desired file, click on “Go!” button. Step 4: Then the website will prompt to select your account type. If you are a Premium member, then click on the “Premium” button otherwise click on “Free”. Step 5: After this the site will process your file for few seconds. Usually, it takes 10 to 20 sec. Step 6: After the website processed your .torrent file then click on the download button (Blue down arrow) or click on “.zip” button. Step 7: Zbigz will again prompt you to select your account type, so choose one as per your condition. After clicking on free or premium one, an IDM dialog box (Notification) will show then click on Start. Your downloading will begin immediately. I hope this tutorial will help you to download torrent with IDM. If you face any problem regarding this tutorial feel free to ask in the comments section. Don’t forget to share this tutorial with your friends, may someone also looking for this. How to Reset or Bypass Windows 7 Password? 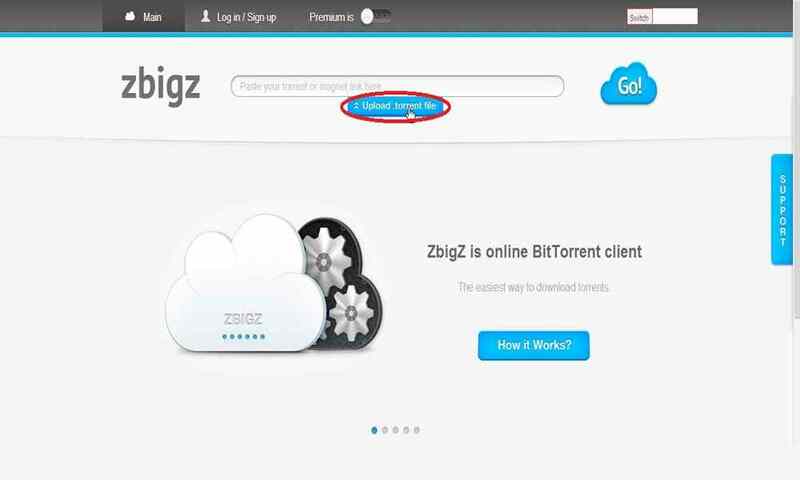 Note: – As a free user you can download torrent files with IDM with the maximum size of 1GB or less than 1GB through Zbigz. They allow maximum 1GB/file for free members with the maximum downloading speed of 150kb/sec.